While the name of the next generation flagship Galaxy smartphone is often just assumed to be Galaxy S III, we are yet to hear the same being confirmed by Samsung. Until now, sort of. 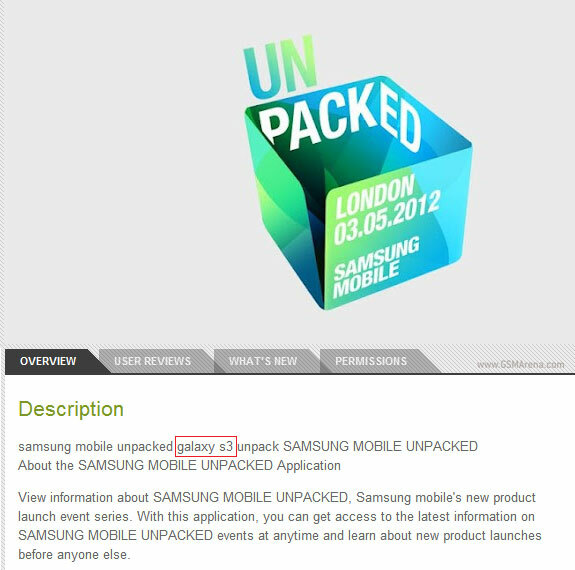 Samsung has released an app on the Google Play Store for its Mobile Unpacked 2012 event happening on May 3. In the description for this app they have used the term "galaxy s3". This is the first time we have seen Samsung use that name. Scrolling down on the apps description reveals the same term being used in the search keywords. It could be that this really is the name of the next Galaxy phone or Samsung is simply using it as a search tag, knowing a lot of people are using it to search for the phone and hoping it would direct them towards this app and make them download it. The fact that it is just carelessly written as "galaxy s3" instead of "Galaxy S 3" or the proper "Galaxy S III" further makes us believe that it might just be a search keyword. Either way, we will find out soon enough. May 3 is just over a week away from now. Well no one really cares abt ur opinion as ur just a common troll. Also,just so that u know, this 'cheap piece of plastic', as u call it,has already become a best-seller EVEN BEFORE ITS ANNOUNCEMENT!!! http://www.androidauthority.com/samsung-galaxy..­.